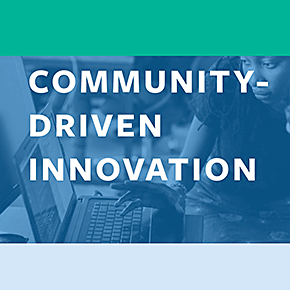 Strong, prosperous, and inclusive communities are built upon engaged and connected citizens who actively participate in shaping their social, economic, and political future. The mobile phone, the internet, new digital technologies, and innovations have created unprecedented access to services such as finance and education, as well as opportunities for citizens to engage in community action and democratic processes. Yet, for the most marginalized who lack connectivity, these technologies can further exclude them from essential services and decision-making processes. Further, local and national governments too often fail to engage their citizens in real consultation and co-creation of public services. It is no surprise that trust in governments, corporations, and other institutions around the world is low and often decreasing—47 percent of global survey respondents to the Edelman Trust Barometer report distrusting their government. And while more and more countries have become democratic in the past decades, voting rates are declining in many countries. Citizens and communities should be at the forefront of identifying civic problems and building effective solutions to address them. Technology is a key lever to help communities achieve this, thus creating better access to essential services such as housing and transportation, promoting real participation and inclusion for all, and reducing economic inequality and local displacement.